Kate is a 44 year old woman and mother-of-two who has been training at ASF Central for over 5 years. Having such a deep connection with her, we took a few minutes to talk to her about her favorite facets of ASF, what she loves about her trainer, what she appreciates about the changes she’s made since being with us and some of her goals for the future! Why did you decide to join ASF? 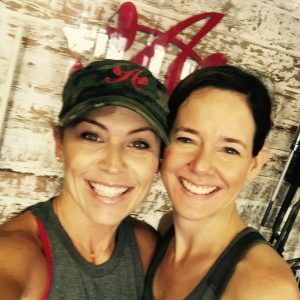 I had worked out with Krista when she had a boot camp, and it was awesome! After having two kids, my body had changed. I wanted to strengthen my core and just increase everyday functionality (not groaning when I have to bend down to pick up something off the floor, for example, which I do a lot as a stay-at-home parent!). I also wanted to get ahead of the loss of muscle and bone density that naturally occurs as we age. I didn’t want to head into my forties and fifties thinking that my strongest days were behind me. How close are you to meeting them? I am amazed at what I’ve been able to achieve, strength-wise. I have definitely achieved what I wanted to, but as we all know you have to keep at it or you’ll lose it! I’m not sure what the “next level” is for me but whatever it is I am sure Krista will get me there! What changes have you noticed in your body, mind, spirit since starting at ASF? I feel stronger, more stable, more confident, and more optimistic! What challenges have you had to overcome, if any, since starting out at ASF? Any surprises since starting at ASF? I was really sore in the first months, and a little nauseated! I have had to up my nutrition before and after the workouts to make sure my body has the right fuel. Why do you like working out with Krista? Krista is amazing! She is always positive, and she brings out the best in me. Even on days when I’m not feeling like a workout, or I’m not in a good place mentally, Krista will say, “Okay, let’s do some squats!” And boom—my day is turned around. What is it about Krista/ASF that keeps you coming back? Whenever I come in to the gym, I feel like it’s part of my home—everyone is friendly and there is a really positive vibe. Any advice you’d share with a newcomer to ASF? They meet you where you are—at your level of fitness—and bring out the best! Kate was nominated by her trainer of 7 years, Krista Bergeron. Krista is acknowledging Kate because she is one of ASF’s first members, following us from our very first location where she began her journey in June 2010. Kate is hard-working, consistent and open to coaching from Krista and others. She has beautiful form and an amazing sense of humor! Krista feels super-fortunate to have her as a friend and client and believes they make an excellent team in getting Kate to her goals and surpassing her own expectations. Click here to read what Kate has to say about her experience with Austin Simply Fit. Learn more about Krista here!